What is Dye Sublimation Photo Printing? 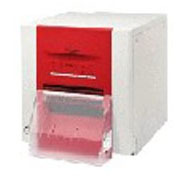 We use two Mitsubishi iCP9550DWS Dye-Sub printers with us. One for printing 9x6" prints and the other for printing 7x5" prints. Dye-sublimation is a process of creating photographs using a printing technique that diffuses dye onto paper. This dye comes in the form of a ribbon, which is converted into a diffused gas when heat is applied, and is absorbed by a special receiving layer on the paper. The print head heats very accurately to varying temperatures, creating different shades of colour depending on the amount of heat that is produced. The print head in Mitsubishi iCP9550DWS Dye-Sub printers, is capable of producing 256 levels of each colour (cyan, magenta, yellow), and is able to create a total of 16.77 million true colours by combining these three primary colours. Using a special over-coating layer, the dye layers are sealed into the paper and the image is protected against UV light, fingerprints, and even water. There is no smudging, running, or blotching because your prints are dry and ready to touch as soon as they leave the printer. Dye-sublimation differs greatly from inkjet in many ways; most significantly in quality. Dye-sub is known for its high quality and continuous tone output. Continuous tone means that all gradations of colour are used when creating an image. For example, when creating a grey scale, from black to white, a continuous tone printer will show all shades of grey in between the black and the white by actually printing them. A half-toning device such as an ink-jet printer will use a dithering technique of placing dots close together in order to trick the eye. 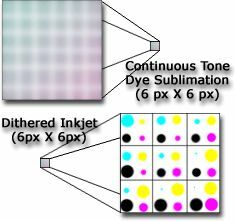 In other words, ink jet printers use a series of black dots placed close to white dots in order to trick the eye into blending the pixels when viewed. With magnification the difference can be seen where the dye-sub output is clear and sharp, but dots can be seen on ink-jet prints. With our process you do not have to wait for proofs, you may choose there and then, after the photo-session the photos that you require. If there are young people under the age of 18 at your event you will need to provide us with proof that their parents consent to them being photographed. If this is not forthcoming, we will not photograph and your deposit will be forfeit. Click here to email us if you would like to make further enquiries about our printing.